Little is known about the origins of the largest Buddhist monument in the world, Borobudur located in Java, Indonesia close to Jogyakarta. The exact dates are unknown though it is believed to be have been built around 800 AD. In 1006 a massive earthquake struck western Java which caused the volcano Merapi to erupt covering everything for a few kilometers radius of the volcano with lava and volcanic ash, including Borobudur. The ruins were rediscovered in 1814 by Sir Thomas Stamford Raffles (who later founded Singapore). There were rumours of ancient sculptures in the hills around Megelang, close to Jogjakarta. Sir Raffles sent one of his engineers, H.C.C Cornelius to go searching if the legends were real. The search party, led by Cornelius found a large hill which in fact was the monument covered in lava. Sir Raffles ordered that the site be unearthed. Tons of vegetation and earth were removed over several years. The earthquake had shattered many of the carvings and statues. There had been many panels throughout the monument that had depicted the Buddha's life though these had been eroded by rain even before being covered by the volcanic eruption. The British and after them the Dutch colonists (from 1816) did not have the experience to restore the monument so it was left uncovered for around 80 years. Many of the stones were removed by local villagers for construction of their houses and statues were removed to decorate gardens. Even the Dutch removed some of the items as souvenirs and even presenting them to foreign governments as gifts, including to the king of Siam (Thailand) in 1896. Many of these items were never returned and are still displayed in museums around the world. Restoration was contined by a Dutch engineer, Theodor Van Erp between 1907 and 1911. He managed to restore the lower levels and the upper terraces and the very top stupa though the base was unstable and at further risk from earthquakes. In 1960 the United Nations declared Borobudur the eighth wonder of the world and sent a team of engineers, architects and experts in stone conservation to reinforce the foundation and complete the restorations. IBM Indonesia started a project which documented over 1,300,000 stones. Each stone was removed, restored, tagged and returned to it's original position. Many of the broken stones around the monument were analyzed and a computer program assisted them with placing them in the right location. Even sculptured heads of the Buddha statues were matched with the correct statues. 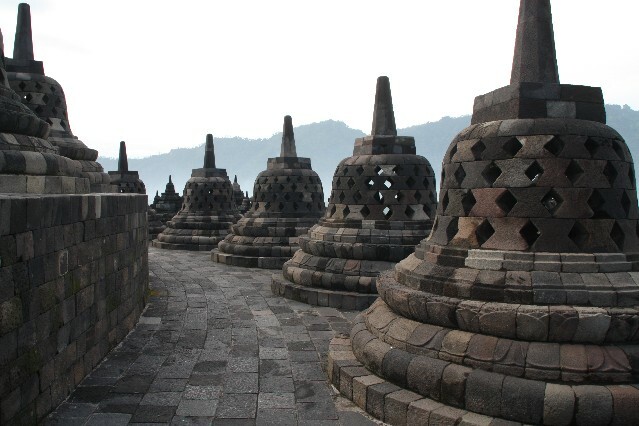 From the work completed to restore the monument, experts estimate it originally took around 30,000 stone cutters and 15,000 people assisting with carrying the stones to complete Borodudur. With these numbers it would have taken 80 years to complete the task. Borobudur is 123 meters square and 32 meters high. There are 1460 carvings depicting the life of Buddha and 432 small Buddha sculptures. 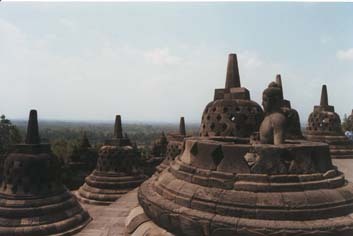 There are four levels to Borobudur, the first level depicts the life of Prince Siddharta who become the Buddha. There are more that show his mother, Queen Maya, dreaming of the greatness her unborn son would achieve. Others show sailing ships, riding of elephants and houses and temples from that time period. 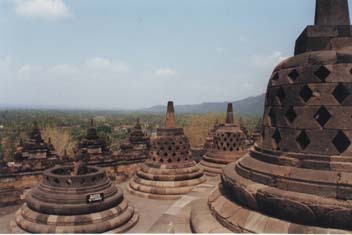 The top level has 72 stupas, large bell shaped carvings with Buddha statues inside. It is good luck to reach inside and touch the toe of the Buddha.